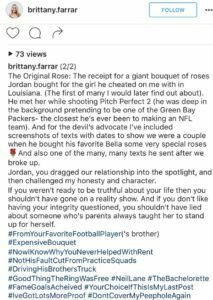 Jordan Rodgers has been called out YET again by his ex girlfriend Brittany Farrar and this time she has proof. 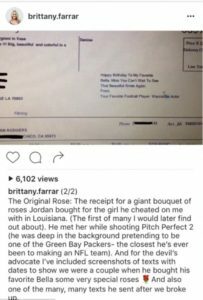 Brittany Farrar took to Instagram last night with a picture showing a purchase order for a large bouquet of roses allegedly purchased by Jordan for the girl he cheated on her with. She also posted a picture of text messages that Jordan sent her the same day he sent the roses to another girl. 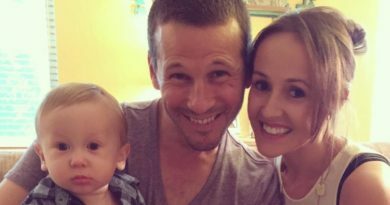 ‘You’re wondering why there isn’t a flood of positivity around your engagement? 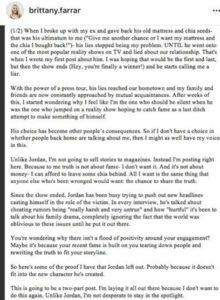 Maybe it’s because your recent fame is built on you tearing down people and rewriting the truth to fit your storyline.’ she captioned the pic. 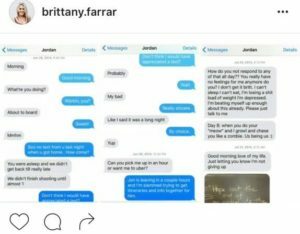 Here are the original posts straight from Farrar’s Instagram.